Wow, custom food packaging supplies have just gone to a whole new level! Check out the great custom printed clear plastic PETE Cups from Gator Paper. These clear plastic PETE Cups are perfect for displaying custom drinks while promoting drink safety at any outdoor event. Show off your business skills by serving your customers drinks in this lightweight durable clear plastic cup. Serve drinks on the go? No problem! 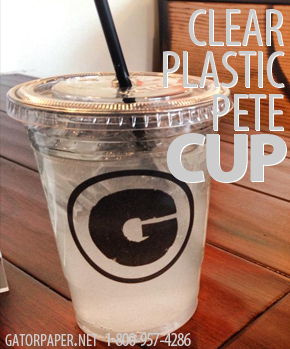 Our custom printed clear plastic PETE cups are available to order with disposable lids. Gator Paper offers a great variety of custom printed food packaging, from paper sheets, cocktail napkins, scoop cups and more. This company is your one-stop-shop for custom printing food packing. And with a custom printed logo placed on your food packaging, you are sure to push your company’s image to the top! These cups are going to take over! Serve beer or cokes at sporting events, bars, restaurants, or even your own backyard in this perfect plastic cup. Having a party or wedding? Send us your favorite logo or design and we can print it right on the cups! The Clear plastic PETE Cups can be printed with up to 3 spot PMS colors. And of course, we can match any color on the PMS chart! Gator Paper offers the clear plastic PETE cups in multiple sizes: 10oz, 12oz, 16oz, 20oz and 24oz. Select what fits your needs best and have your order on its way. Most orders ship within 4-5 weeks but call us today and discuss rushing your order. We are here to make your food service life easier! Available for order in 10oz, 12oz, 16oz, 20oz and 24oz. Perfect for displaying custom drinks!